Custom sites have long been the go-to plan for the most competitive real estate companies with a large budget and time, but what about the rest of us? Introducing our Limited Edition custom site called “New York” – ideal for agents who want a custom design exclusive to their area, but don’t want to pay the custom price tag. We have taken our 20+ years of experience to develop a stunning, mobile responsive website that has all the features you demand. 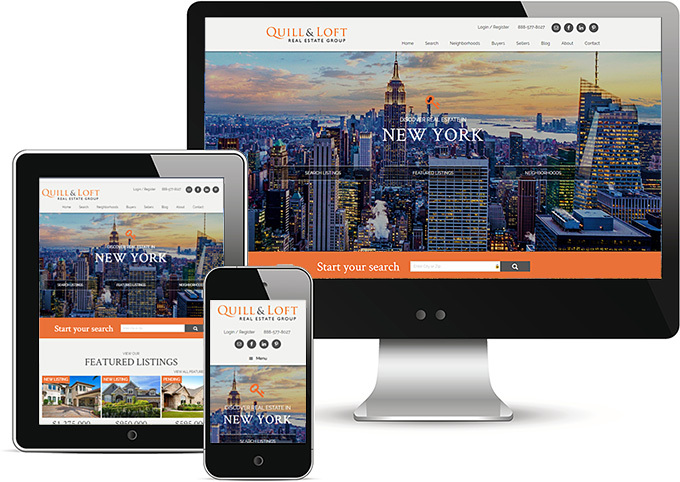 If you yearn for a unique site, but need to skip the additional time and money needed in perfecting a custom real estate site, then the Limited Edition New York WordPress Real Estate Theme may be perfect for you. Our Limited Edition was inspired by our best Real Estate WordPress Themes and previous custom work, we pulled out all the stops in creating this elegant, effective, and easy to use theme. When you purchase this or other Limited Edition designs, you’ll know exactly what you’re getting before you buy. As we set up your site and personalize it with your special branding, we’ll assist you with selecting photos and colors for the site. We’ll be here to work with you along the way, we want to see you succeed and we offer personalized training and support to make sure you do! Our Real Estate WordPress themes are designed to be 100% responsive, meaning they’ll work and look fantastic on every device and screen size, be it the smallest of smart phones or the latest and largest in desktop monitors. With most homebuyers and sellers utilizing their phone to search for listings, having a responsive site isn’t a luxury, it’s an absolute must! These Limited Edition Real Estate WordPress themes include all of our real estate add-ons (a $900 value), and so much more. You’ll receive an Team/Agent Roster (perfect for small or large teams), showcase Featured Neighborhoods with impressive photos, and best of all – your Featured Listings include custom single property profiles (a $500-$700 value). Single property profiles allow you to step up your marketing game and showcase your featured listings in a way that will impress sellers and help you win listings. You can even take it one step further, by purchasing a unique domain name (such as 1234PropertyAddress.com) which can send visitors directly to that properties page. IDX Solutions (property searches for real estate) allow you to pull in listing data from the MLS. Lead capture forms encourage leads to sign up with you, after which you’re able to track their activity such as what searches they’re performing and properties they’re viewing. Our team has integrated IDX in over 3000+ websites so we can help you determine the best solution for your needs. Need to take your site to the next level? Ask us about MarketBoost and how you can use automated Market Reports to stay in touch with leads long-term and enhance your real estate website design. We also offer varying levels of WordPress Maintenance Care Plans so you don’t have to worry about servers, backups, updates and security. When it comes to our WordPress real estate websites we think of everything so you don’t have to. 6 Undeniable Reasons Why Your Website Should Be Responsive – Why catering to the growing number of mobile users with a responsive website is key to your business. 3 Reasons Why Responsive Web Design is the Best Option For Your Mobile SEO Strategy – If SEO is a major factor for you, then learn why having a mobile responsive site is imperative. 5 tips for capturing clients who research you online – Your website is the face of your business so make sure you have the most optimal online tool working for you. 60 Percent of Online Traffic Now Comes From Mobile – Studies show mobile devices and through mobile apps account for half of digital traffic online.